I will never be caught wearing a backpack with a sport or suit jacket – no self-respecting gentleman in a suit would ever carry a backpack to work (my opinion) and I don’t want to ruin the shoulders on my suit and sport jackets with the backpack’s straps. And while a briefcase seems like the logical choice, I have yet to find a briefcase I’m taken aback by (although Satchel & Page’s Founder and Aviator Brief look really good, despite high price tags). 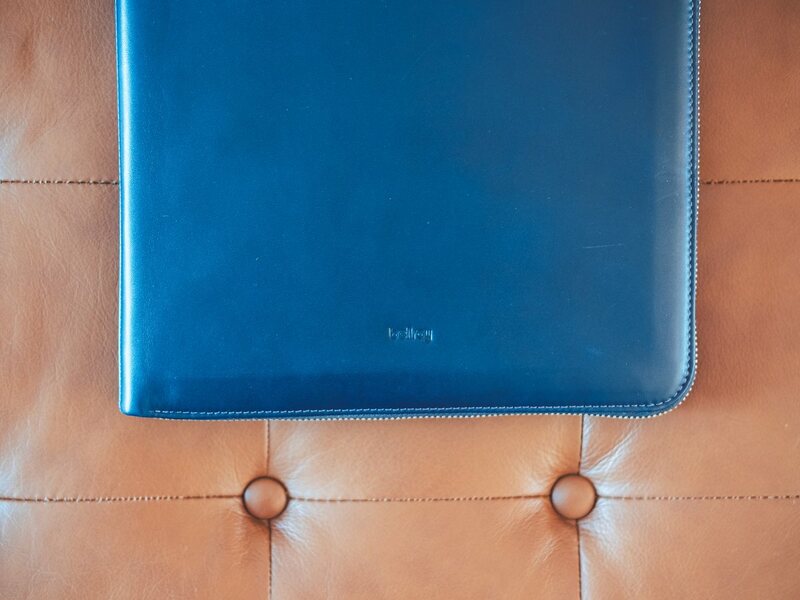 Editor’s Note: The Bellroy Work Folio A4 was sent for purposes of review. 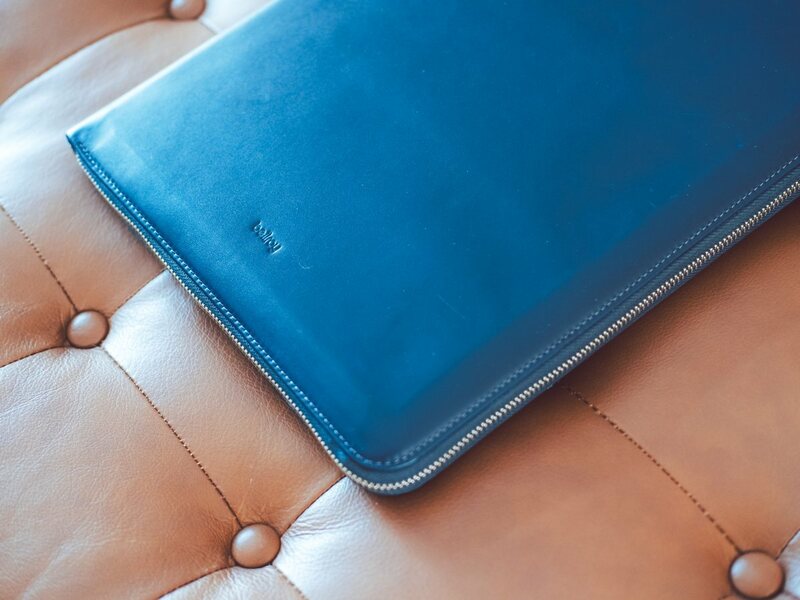 The Work Folio’s design and leather are simply exquisite — there’s no better word to describe it. 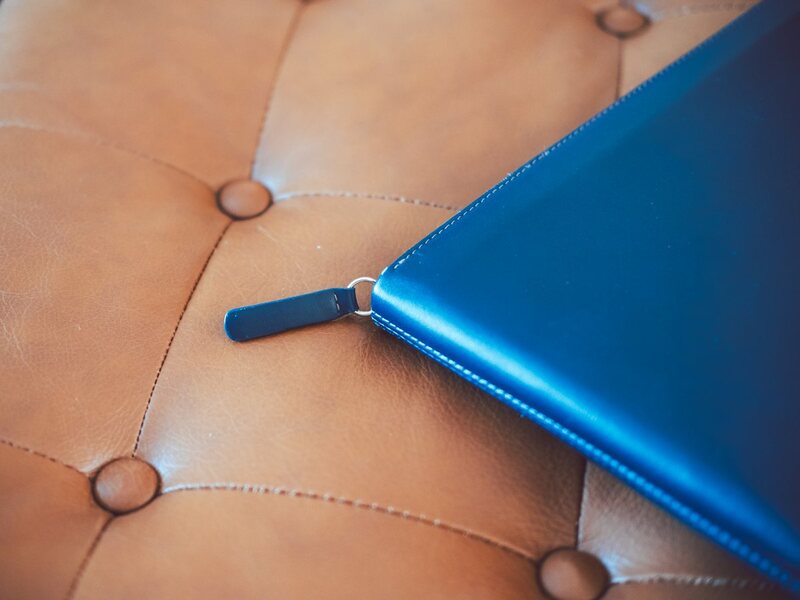 Like all Bellroy products, the Folio’s leather is supple and durable. The Folio comes in black, saddle brown/camel brown, and a deep navy, which I find to be elegantly understated. The leather does a good job of handling day-to-day bumps and has aged well. It doesn’t take on bumps and bruises like a more raw leather, like the Midori Traveler’s Journal, for instance. While the exterior is made of a durable leather, the enclosing material around the Folio’s edges are of a woven fabric. This allows the Folio to expand if you need to pack a few extra belongings for the trip to work. 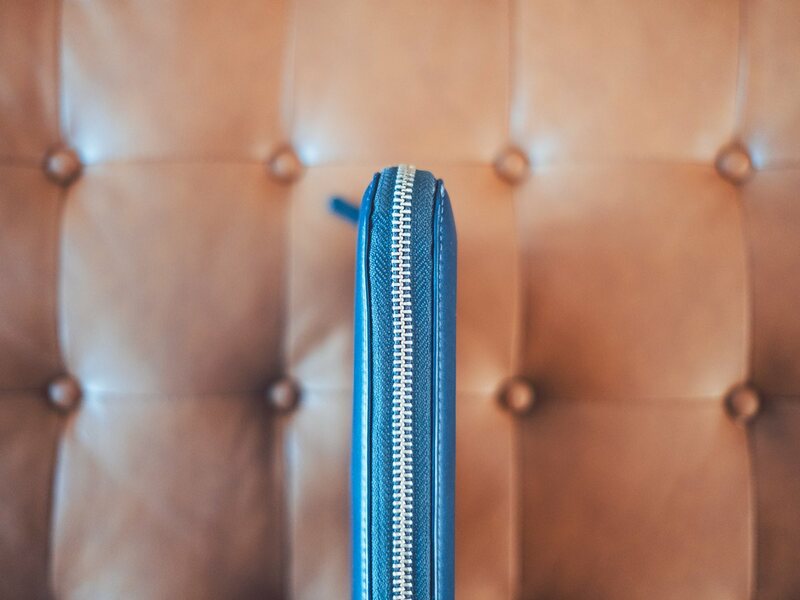 The Folio opens with a large, smooth, brass zipper — one of the best zippers in my household. It hasn’t caught once in my month of use and feels durable enough to last for years. Bellroy first burst onto the scene with wallets capable of holding just as many cards and just as much cash as the older-designed bi-fold wallet, without the massive heft in your front or back pocket. Many of those organizational lessons have carried into the Work Folio. 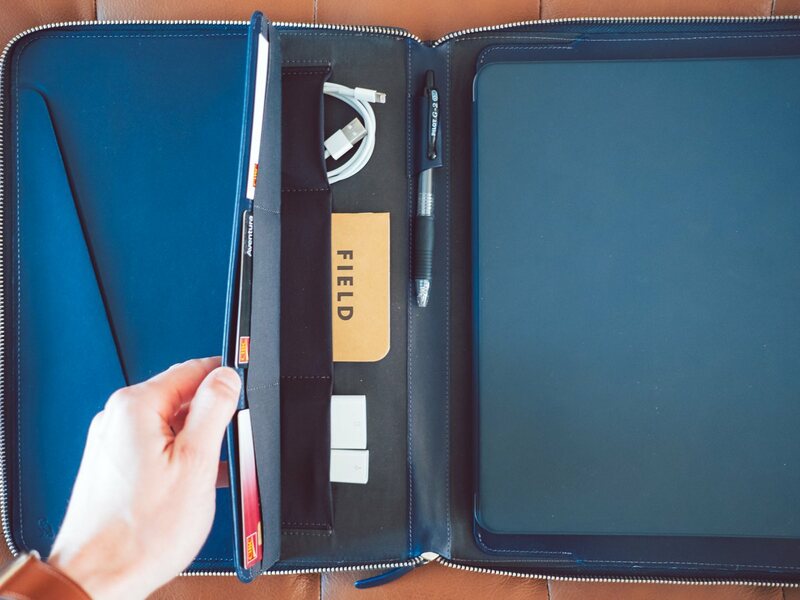 On the far left, the Work Folio has a specific sleeve for transporting documents or for holding boarding passes at the airport. This is the number one reason why the Work Folio is part of my daily carry. So far, documents held in this sleeve have not bent or torn, and come out looking perfect when I get home from the office at the end of the day. With all that’s going on inside the Folio, my expectations for this document sleeve were far exceeded. Inside the left cover, a flap flips up to reveal three elastic pockets. The middle pocket is large enough to hold a 3.5-inch-by-5.5-inch memo book (like a Field Notes) or a passport, while the other pockets can expand to hold extra pens, Lightning cables, or even your iPhone (the Plus/Max-sized iPhones will only fit into the middle elastic pocket). Holding bulky items in these pockets runs the risk of the Folio becoming too thick to close, but a small USB-C charger will fit no problem. The flap itself also has some business and credit card slots. 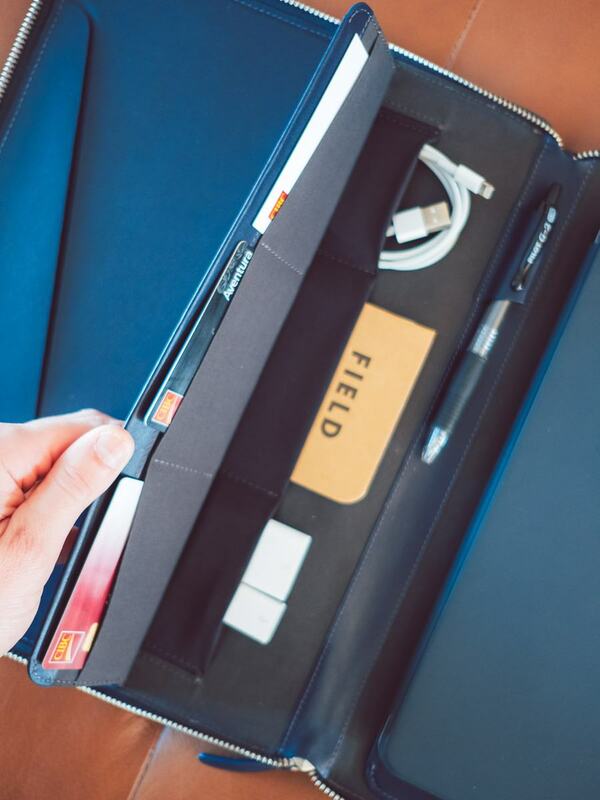 If you’re traveling with the Folio, these slots are great for storing extra credit cards or gift cards. 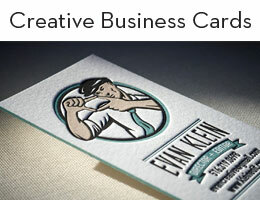 Otherwise, I think these sleeves are best for business cards to hand out. There’s a handy pen loop in the middle of the Work Folio. The second generation Apple Pencil is too skinny for this loop, mind you, so you’d be better off carrying the Pencil in one of the elastic pockets under the left-side flap. The Work Folio ships with a blank A4 notepad, which slides nicely into the notepad sleeve on the right side. 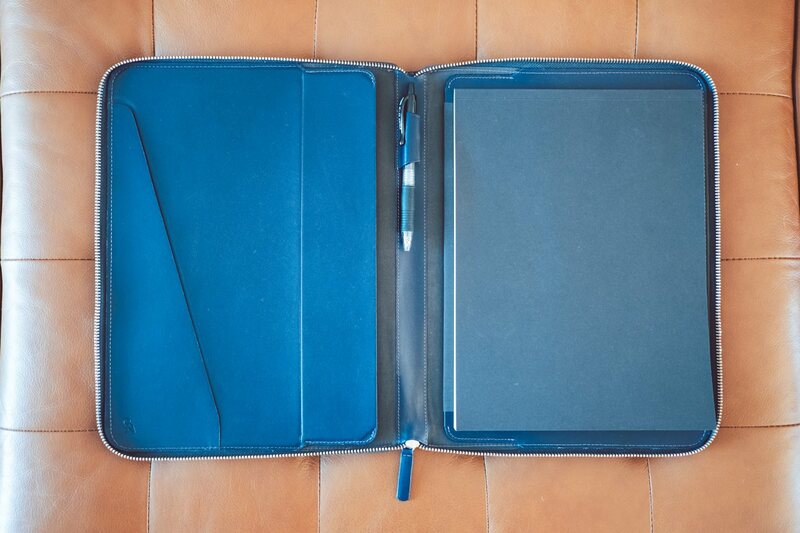 Underneath the sleeve is a compartment for carrying a smaller 13-inch notebook or an iPad. 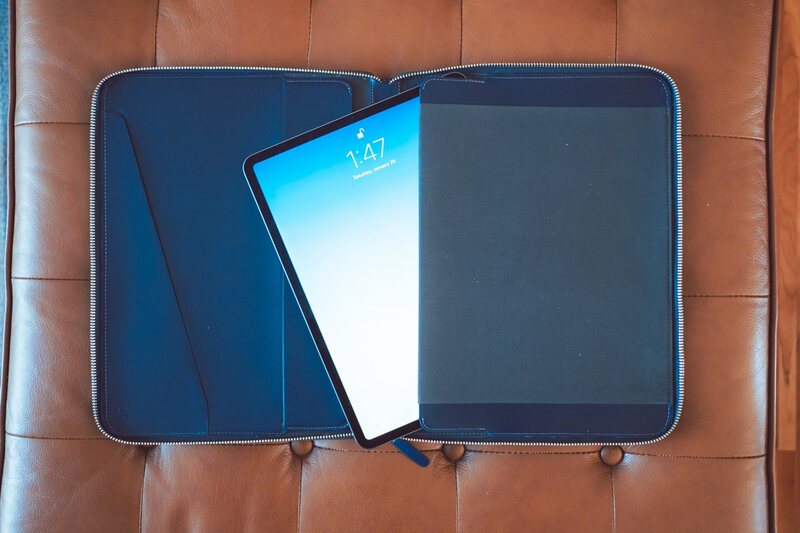 The 12.9-inch iPad Pro fits in very snugly, and only when it’s naked — the Smart Keyboard Folio makes the iPad Pro package too large, and the Pencil is better kept in an elastic pocket. The iPad Pro on its own fits very nicely and has some room to spare vertically, implying the new 13-inch MacBook Air should fit as well. Of course, Bellroy’s marketing message of “combining analog and digital” requires both the A4 notepad and an iPad to be in tow. In my experience, a few modifications are needed, however. For one, Bellroy’s shipped A4 notepad isn’t very good. The blank canvas paper is thin. My preferred pen — the Pilot G-2 0.38mm — digs into the poor paper. And the front cover of the notepad isn’t very durable. To get the most out of the A4 notebook sleeve, I recommend grabbing a better notepad from the likes of Rhodia. Second, because the iPad Pro becomes too thick with the Smart Keyboard Folio attached, I’ve found I have to keep the iPad Pro on its own in the iPad sleeve and carry the Keyboard Folio separately in the middle of the Work Folio. This is less than ideal and a problem I don’t see fixed even with a smaller iPad. As a result, I’ve removed the A4 notepad entirely and don’t bother to carry the iPad Pro in the tablet compartment. I can fold up the iPad in the Smart Keyboard Folio, leave the Apple Pencil attached, and throw the whole thing into the Work Folio as one big package. A Pencil tap on a sleeping iPad Pro opens directly to Notes, meaning the whole A4 notebook element is duplicated. I just wish I could set a default note-taking app instead of Notes. Other than that, I carry a Field Notes book, a couple spare pens, and an extra Lightning cable in the Work Folio. This is generally all I need on a daily basis. 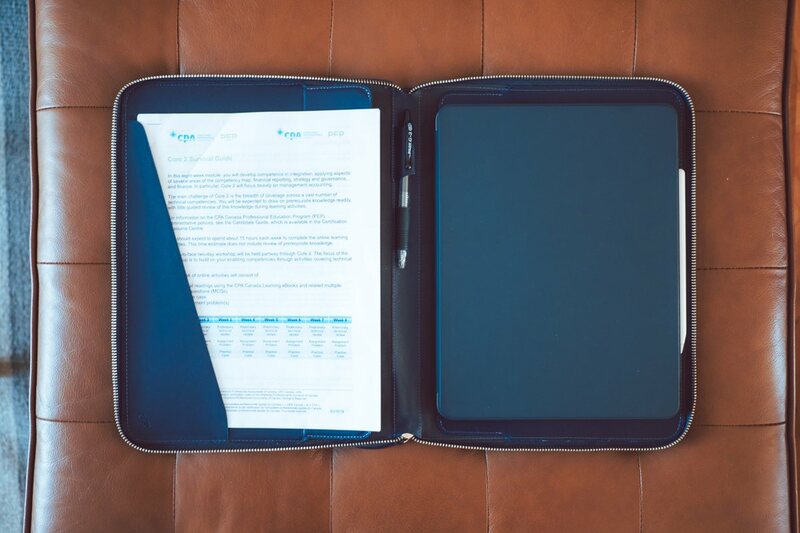 If I need to haul more to the office, the Work Folio fits into any bag with ease. 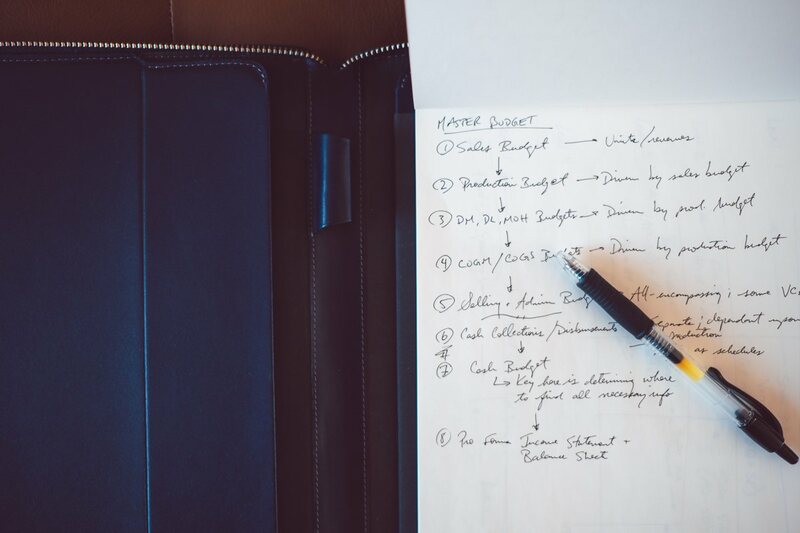 The Work Folio isn’t a cheap leather folio, for good reason — the Work Folio’s design and leather quality are off the charts and some of the best work I’ve ever seen. It’s big, hefty, durable, and quite stylish, so a larger price tag makes sense. However, $300 USD is going to give many people pause. You’re bound to find less expensive alternatives which carry the same amount of stuff each day, while coming somewhere close to Bellroy’s quality and design. 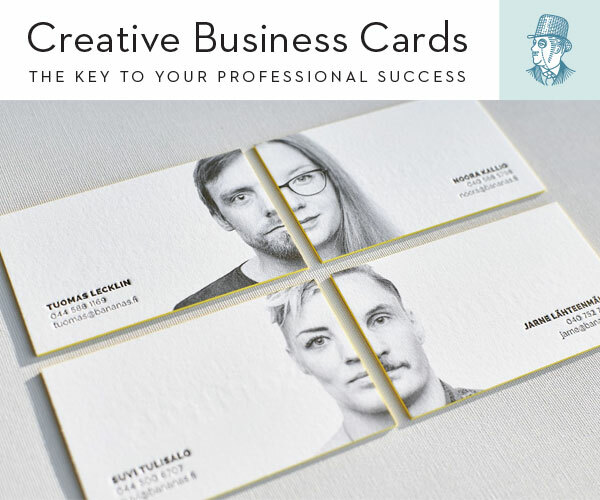 I wouldn’t blame anyone for giving me a chuckle if I said the Work Folio is totally worth the $300 price tag. I think a better word to describe the price tag is “fair”; the $300 price tag is a fair price for the Work Folio A4. It’s expensive, but I do believe you get what you pay for. I expect this Folio to last me for at least the next 10 years, if not more. Bellroy continues to deliver the highest quality everyday carry goods, and the Work Folio is no exception. 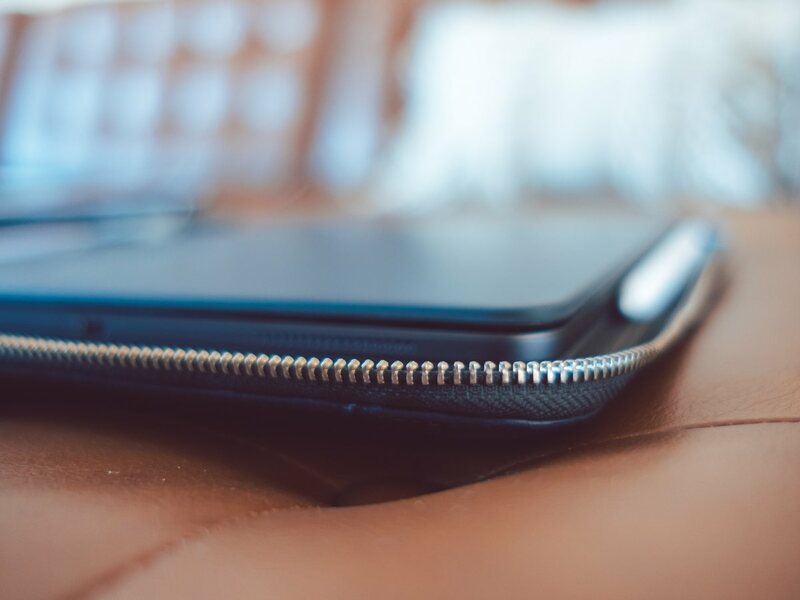 I haven’t put my hands on their latest Designers Edition line which ships with Bellroy’s finest leathers, so I’d say the Work Folio is the best leather product from Bellroy that I’ve tried to date. The quality of this product is simply stunning. As always with Bellroy, you get what you pay for. I like having the A4 Work Folio on me each day and I’m still learning how best to carry my everyday carry needs inside. Regardless, I expect the Work Folio will have a long-term home in my everyday carry.